Along with Reverend Jeremiah Wright, Pastor John Hagee, former radical William Ayers, and Alaska Trooper Mike Wooten, add another name to the list of those who rose to grab, or perhaps be thrust into, 15 minutes of fame in the 2008 election narrative. Last week, an Ohio plumber, cited by John McCain and mentioned some two dozen times during the Oct. 15 presidential debate, became an instant star. And while that star was quickly fading, it burned bright enough from Oct. 13-19, to make the saga of Joe the Plumber the No. 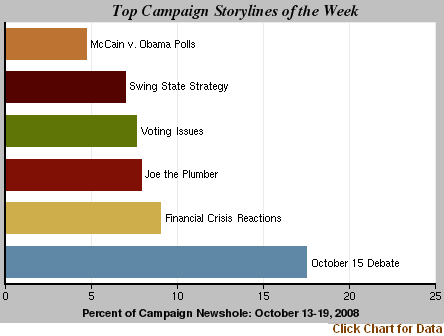 3 campaign storyline of the week (filling 8% of the election newshole) according to the Campaign Coverage Index from the Pew Research Center’s Project for Excellence in Journalism. The final and perhaps most combative presidential debate of the campaign was the No. 1 campaign storyline (at 18% of the news hole). And even though both candidates produced new economic proposals costing an estimated $100 billion or so, coverage of their response to the financial meltdown barely edged out the plumber (at 9% of the coverage). As it turned out, Plumber Joe’s first name is Samuel and he is not a licensed plumber. But his emergence as a celebrity seems reflective of a media narrative that has alighted on some unlikely players, in this case perhaps in the hopes of a twist in a campaign narrative that seems, at least in the media’s mind, to be hardening. The coverage is also taking on an increasingly tactical lens in the final days. Last week, attention to tactics and strategy—including McCain’s invocation of the plumber to represent the working man—accounted for 26% of the newshole, making that general theme the biggest component of the week’s election coverage. Coverage of these strategic aspects of the race included the fight over key battleground states (7%) and the parade of polls, including numerous daily tracking surveys, at 5%. Another category closely connected to the horse race involves the increasingly sharp attacks defining the closing days of the campaign. Last week, themes connected to this more negative twist to the race filled another 8% of the newshole. In addition 8% more of the campaign narrative was devoted to possible election irregularities. A good deal of this related to allegations of voter registration fraud by the activist group ACORN, a McCain line of attack as he tried to link Obama with ACORN. How much coverage last week was about major policy issues? The economic crisis and elements of the economy not directly related to that crisis combined for 13%. After that, all other policy discussions accounted for a total of 3% of the newshole. The subjects of health care, terrorism and security issues, Iraq, and Afghanistan, each accounted for less than 1% of the election coverage. When it came to the competition for exposure last week, the presidential candidates were virtually even, as they have been for the last several weeks. 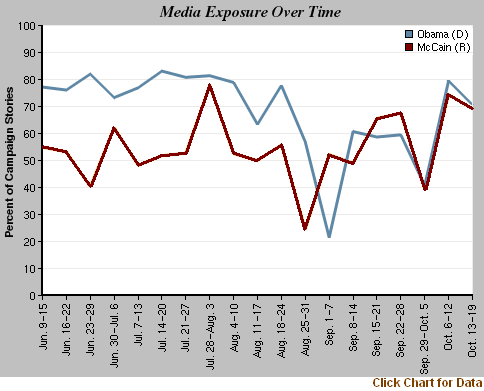 Obama registered as a significant or dominant newsmaker in 71% of the stories compared with 69% for McCain. And in keeping with the trend since the Oct. 2 vice-presidential debate, the running mates are now very much secondary to the men at the top of the ticket. 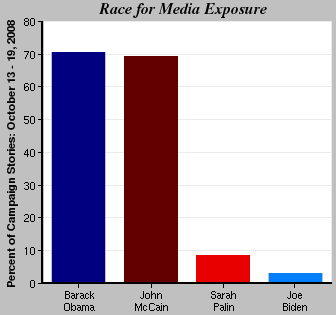 That has often been the case for Joe Biden, who was a significant or dominant factor in only 3% of last week’s stories. But it’s now also true of Palin, who registered in 8% of the coverage, her lowest level since she was introduced as McCain’s choice on Aug. 29. Indeed last week, the two running mates took a back seat to the newest media phenom in the 2008 campaign, Joe the Plumber. Joe, or Sam, was a lead newsmaker—meaning he appeared in at least 50% of a story—more often than Biden or Palin last week. How long he will remain a “shooting star,” as an ABC news report put it, is open to question. Still, the McCain team has continued to make him a talking point on the campaign trail and if nothing else, he has become another chapter in the highly episodic media narrative of this campaign. Overall, the presidential campaign accounted for 51% of the newshole, as measured by PEJ’s News Coverage Index for Oct. 13-19. That’s up 10 points from the previous week and it represents the highest level of election coverage since the week of the GOP convention (Sept. 1-7). Moreover, after several recent weeks when the economic crisis was bigger news than the campaign, the race for the White House has clearly re-emerged as the lead topic in the news, generating more than twice as much coverage as the financial situation last week. The campaign was the top story from Oct. 13-19 in all five media sectors, accounting for a whopping 80% of all the cable airtime studied. Last week, with the final McCain-Obama debate widely viewed as one of the Republican’s last chances to change the dynamic of the campaign, the strategic narrative was favoring Obama. An Oct. 15 Los Angeles Time story reported on the paper’s own poll showing Obama stretching what had been a four-point lead into a nine-point lead over McCain (50% to 41%). A key theme was the impact of the economy on the race. “In the weeks between the two surveys, the nation’s financial system teetered toward collapse, and the poll shows the effect of that upheaval on voters,” the story said. Media reaction to the Oct. 15 debate followed a predictable pattern. Many of the pundits scored it as a draw, with McCain being the more aggressive debater and Obama displaying his trademark coolness and failure to rattle. The quickie polls gauging viewer sentiment, as has been the case in all the debates, showed Obama to be the winner in the public’s view. And many post-mortems concluded that McCain did not pull off the dramatic win he might have needed to change the race. There was however, one new wrinkle to the debate coverage, with many accounts describing the encounter as far livelier than its two predecessors. “In the last of three debates, the candidates…engaged in their most intense confrontation of the campaign, clashing on taxes, health care, school vouchers, abortion, energy policy and the increasingly bitter tone of the historic contest,” declared a Washington Post story. The No. 2 story of the week, behind the election, was the financial crisis, filling 23% of the newshole as measured by PEJ’s News Coverage Index. That’s down significantly from the previous week’s total of 36%. The biggest chunk of last week’s coverage on that subject—23%—concerned the elements of the federal bailout plan with the fluctuating Stock Market close behind at 21%. The two media sectors that devoted the most time to the economic meltdown were online (32%) and newspapers (31%). The wildfires in Southern California, were the third-biggest story of the week, at 3% of the newshole, followed by coverage of the economy not directly related to the financial crisis (2%). The baseball playoffs, which produced an unlikely World Series in which the Philadelphia Phillies will face off against the Tampa Bay Rays, was the fifth-biggest story at 1%.